"A Thrilling Act, the Art of Anthony Eterovich 1916-2011"
The sale of paintings and works on paper will be used to draw attention to and benefit the Anthony Eterovich Scholarship Fund at the Cleveland Institute of Art. "A Thrilling Act: The Art of Anthony Eterovich (1916-2011)" opened on April 15, 2016 at Tregoning & Company Galleries, 1300 West 78th Street in Cleveland, Ohio. This retrospective had two extensions and closed on July 30, 2016. 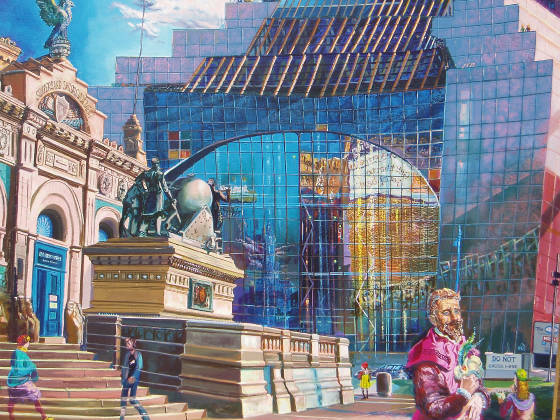 In addition, Mr. Eterovich was exhibited at three other high profile venues including "Fundamental Gestures" at ARTneo, "Out of the Archives" by the AAWR at the Beachwood Community Center and in the Cleveland Institute of Art Study Collection open through Labor Day 2016. Eterovich's work is represented by Tregoning & Company and is available for touring. There was a preview of "A Thrilling Act" for Cleveland Institute of Art Alumni and friends. Please see the Cleveland Institute of Art invite. The preview was reviewed by Martha Towns in the print-only edition of Currents, May 19, 2016. June 15, 2016, Josh Usmani reviewed "A Thrilling Act" online for Cleveland Scene Magazine. The headline is "Four Venues in Cleveland Host Posthumous Retrospective for Anthony Eterovich". April 28, 2016, Dee Perry interviewed Bruce Checefsky and Bill Tregoning on the Sound of Applause 90.3 FM. The headline is "Anthony Eterovich". July 28, 2016, Vivian Goodman interviewed George Kozmon and Bill Tregoning on WKSU 89.7 FM. The headline reads "Recognizing the Life's Work of a Cleveland Teacher & Artst".